Grainy images of a young female fisher with her kit provide the first evidence that this rare forest carnivore is reproducing in the South Cascades, where state, federal and non-profit organizations are working to reintroduce them. The pictures show a female fisher in the Gifford Pinchot National Forest coming down her den tree headfirst, carrying a large kit. “She is hopefully the first of many female fishers we photograph attending a den site and caring for kits in the South Cascades,” said Jeff Lewis, a wildlife biologist with the Washington Department of Fish and Wildlife (WDFW). The adult female fisher is only two years old, the youngest a fisher can be to give birth to kits, said Lewis. “Reproductive success of a female this young and this new to the South Cascades is a positive sign that the reintroduction area can support a self-sustaining fisher population,” said Tara Chestnut, an ecologist with Mount Rainier National Park. 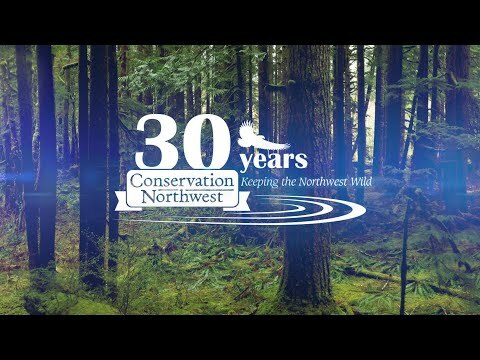 “This is an inspiring milestone that shows how public, private, tribal and non-profit partners can together make big conservation wins happen, restoring our natural heritage and building a wilder future in our state,” added Dave Werntz, science and conservation director for Conservation Northwest. The female fisher was released in the Gifford Pinchot National Forest in February 2016 as part of an effort to restore fishers to the state. Fishers, a housecat-sized member of the weasel family, were eliminated from Washington by the mid-1900s through over-trapping and habitat loss. They have been listed as a state-endangered species since 1998. WDFW, the National Park Service and Conservation Northwest are leading the Cascades fisher reintroduction project. Sixty-nine fishers have been released in the South Cascades to date. Fisher releases in the North Cascades will begin this fall. Documentation of fisher offspring is only one indication of success in the Cascades, said Lewis. Project partners estimate that 77 percent of the fishers released in winter and spring of 2015-16 survived their first year and 64 percent of females established a home range. Project partners also worked together from 2008 to 2010 to release and monitor 90 fishers in Olympic National Park. Monitoring efforts there have shown that the released animals have distributed themselves throughout the Olympic Peninsula and are successfully reproducing. Fishers are related to otters and wolverines and are native to the forests of Washington, including the Cascade Mountain Range. Fishers prey on various small mammals – mountain beavers, squirrels and snowshoe hares – and are one of the most effective predators of porcupines. Re-establishing viable populations of fishers in the Olympic and Cascade Mountains are important steps to down-listing the species in Washington State. The state recovery plan and implementation plan for fisher reintroduction in the Cascades can be found at: http://wdfw.wa.gov/conservation/fisher/reintroduction_cascades.html. Larger version of fisher image. Click here to download the photo! Sources of funding for the reintroductions include WDFW, the National Park Service, Conservation Northwest, the U.S. Fish and Wildlife Service, Washington’s National Park Fund, the Wildlife Conservation Society, the Doris Duke Foundation, Defenders of Wildlife, and those who purchase Washington State personalized license plates, among others. Fisher recovery efforts in Washington also rely on the support of the British Columbia Ministry of Environment, the British Columbia Ministry of Forests, Lands and Natural Resource Operations, the British Columbia Trapper’s Association, British Columbia trappers, and the private forest landowners that participate in conservation agreements for fishers.